Never has a chorus of boos sounded so sweet to Welsh ears. The howls of derision ringing round the Stade de France at the conclusion of Saturday's Paris match were laced with anger and contempt for what they had just witnessed. But if that spelt trouble for Tricolores coach Philippe Saint-Andre, who had the look of a man heading for the guillotine, Welsh counterpart Rob Howley could at last savour a Test win - even a hideously ugly one - at the seventh attempt on his watch. After the thrills and spills of the opening round of Six Nations matches, and Scotland's rousing second-round win over Italy, this was a throwback to some of the more primitive slug-fests of recent memory. It is to Wales' credit that they managed to rise above the mediocrity and fashion a decisive moment of attacking quality, Dan Biggar's delicate dab over the defence giving George North an invitation to score that he grabbed with both hands. On another day the bounce of the ball might have gone into touch. But after all the talk of "small margins, big consequences", with six of their eight straight defeats coming by eight points or fewer, Wales' luck finally turned and Biggar's moment of inspiration yielded a deserved reward. The overriding feeling was not one of euphoria though after a fourth Welsh victory in their last eight visits to Paris, and a fifth win from their last six away games in the Six Nations. Rather it was unbridled relief - at ending that miserable run of losses, at remembering how to close out one of these infernal tight games, at not having to "take the positives" from another demoralising loss - pouring out of every aching limb. For the neutral, there was probably relief simply at a horrible old game ending. "It was by no means a flawless display," conceded Ryan Jones, who made a successful return to the side and the captaincy, carrying and tackling hard, and cajoling extra energy from those around him. "But at least we made up for those errors by working so hard, from one to 23. It is testament to the way we have reacted to that pressure by fronting up, being brave and tackling the French head on." In truth it was a match that neither side looked capable of winning for long periods, with any wit or invention paralysed by handling errors at critical moments, cold hands on a freezing evening, or simply the fear of losing from two sides clearly lacking in confidence. But with both employing similar 'blitz' defences, and trying to bludgeon their way through obdurate opponents, it was little wonder the spectacle suffered. On this occasion, Wales coped better at the breakdown, applying a pressure that stifled many a French attack at source. The visitors did concede a series of penalties and free-kicks at the scrum, where referee George Clancy appeared to have little sympathy for the difficulties of staying upright when the turf was slipping from underneath the front rows' feet. 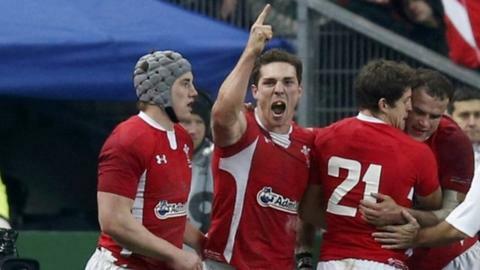 But while those offences cost them territory and six points, the Welsh line-out was reassuringly solid, with Justin Tipuric to the fore, allowing them to maintain a steady supply of possession. Their failure to profit from it on three occasions in the first half alone, from promising positions inside the French 22, remains a cause for frustration as they prepare for their next assignment in Rome. But while Wales' attacking game has appeared blunt and lacking in variety for some time, what is often overlooked is that their last two Grand Slams were forged on defence. Here, as it was against Ireland last week, their tackle completion rate was 91%. "France seem to bring the best out of us, the fact we respect and fear their attack so much," said defence coach Shaun Edwards, noting this was the third game in a row - after their 2011 World Cup semi-final and last year's Grand Slam encounter in Cardiff - that Wales had prevented the French from crossing their try-line. But the cliches of yesteryear no longer apply. France, who had scored at least two tries in each of their past 14 home games against Wales, are no longer synonymous with flair. Mathieu Bastareaud and Louis Picamoles both threatened to make damaging inroads, and full-back Yoann Huget was an intermittent threat from deep, but there was no rhythm or finesse to their attacks, and little brain power to complement the brawn. The pragmatism that served Saint-Andre well in club rugby at Sale and Toulon does not go down well at the Stade de France, where the Tricolores have failed to win their last three Six Nations matches. Saint-Andre has now overseen seven matches in the Championship and won only two - against Italy and Scotland last season. Not since 1982 have they lost their opening two matches. That year they went on to lose a third in a row, a scenario that now beckons again with England at Twickenham next up in a fortnight. Down and out in Paris and London? The drooping shoulders and resigned looks on French faces as they trudged back behind their posts following North's try, even with eight minutes to save themselves, did not suggest a collective belief in their ability to come out fighting. "We know we can't win the title now, but we can still win respect," said Saint-Andre, forlornly. "We must not be scared [of going to Twickenham]. It is a fantastic challenge. We are at the bottom of the Six Nations but we can't give up. In rugby you can fight with pride and desire and we must do that." Who'd have thought it? The French reduced to "playing for pride". But then, as Wales demonstrated here, bloody-minded defiance, and the occasional outbreak of class amid the crassness, can sometimes bring startling results.